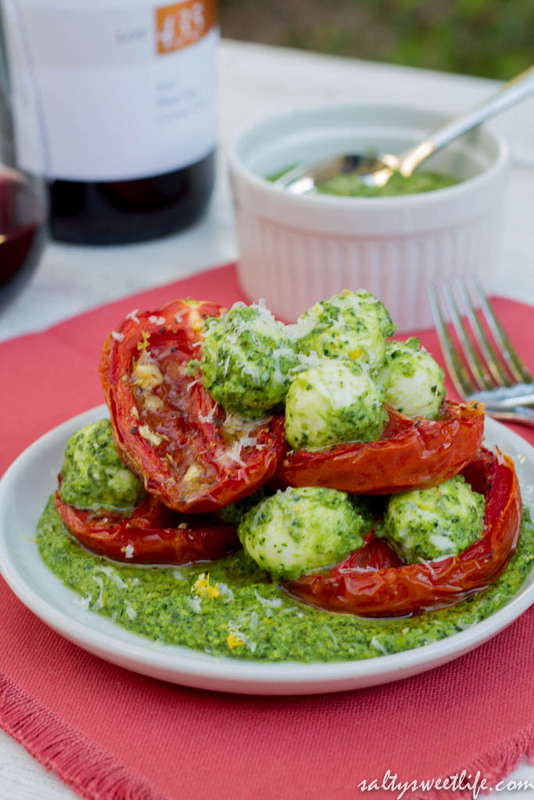 I recently purchased “The Sprouted Kitchen” cookbook by Sara Forte and I became a little bit obsessed with this one particular recipe for “Heirloom Tomato Stacks with Bocconcini and Kale Pesto”; so much so, that I’ve made it twice this week! The original recipe, with its beautiful photograph of mid-summer, juicy heirloom tomatoes nestled on top of a bed of pesto and stacked between layers of fresh mozzarella cheese lured me right in! I was hooked! The only problem is…it’s not mid-summer. Not by a mile. And you and I both know that February tomatoes leave a lot to be desired–they aren’t very sweet; they are often flavorless at best and mealy at worst. I’ve learned that slowly roasting tomatoes with a bit of olive oil, a sprinkle of sugar, salt, pepper and garlic totally solves the problem of less-than-flavorful off-season tomatoes, so you can have this salad year-round! 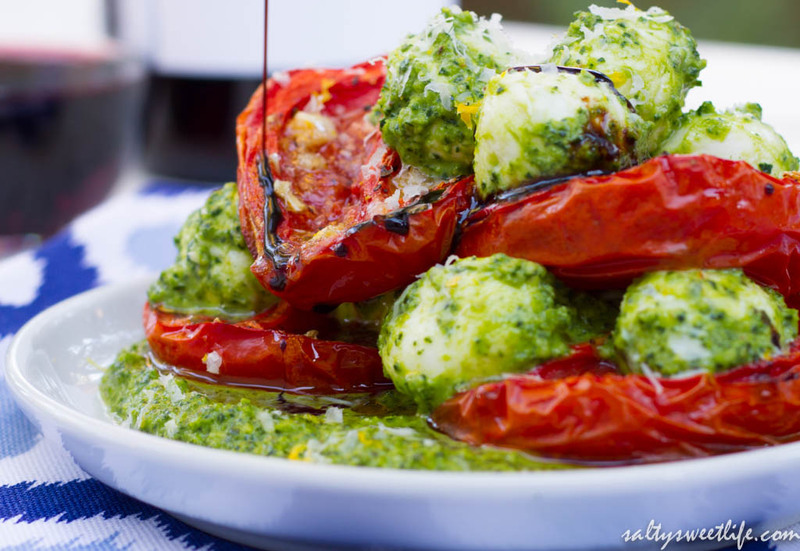 The kale pesto is also a stroke of in-season genius, as it’s too early for fresh basil as well! 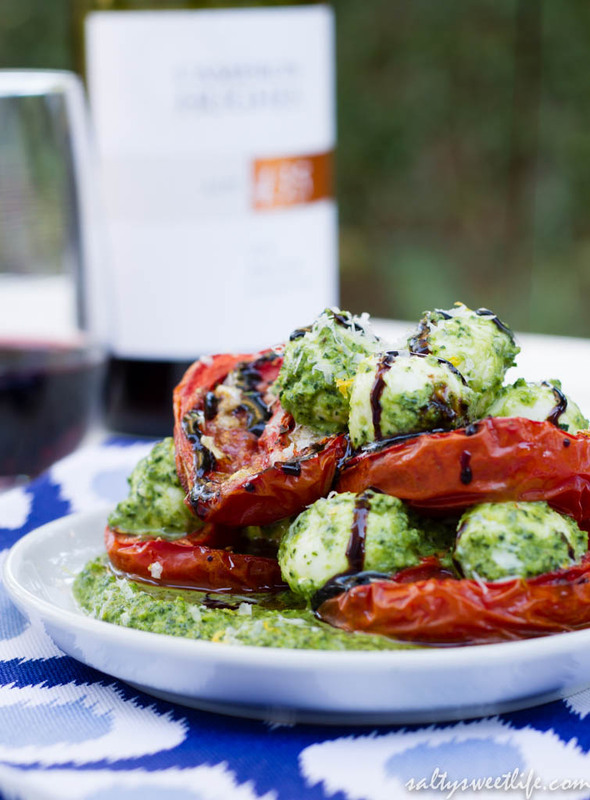 The kale pesto is a perfect counterpart to the sweet, roasted tomatoes and the creamy mozzarella. I was also able to stretch this salad into a second meal! I tossed the leftover pesto and roasted tomatoes with whole wheat pasta for a delicious and healthy dinner! The tomatoes roast in a 275 degree oven for almost 2 hours, so take the timing into account. The first time I made this dish, I used a small bunch of kale from the market. The second time, I used pre-chopped, pre-washed Tuscan kale that I found at Trader Joe’s–what a great time saver! I found the mozzarella balls, or “ciliegine” at Trader Joe’s as well. 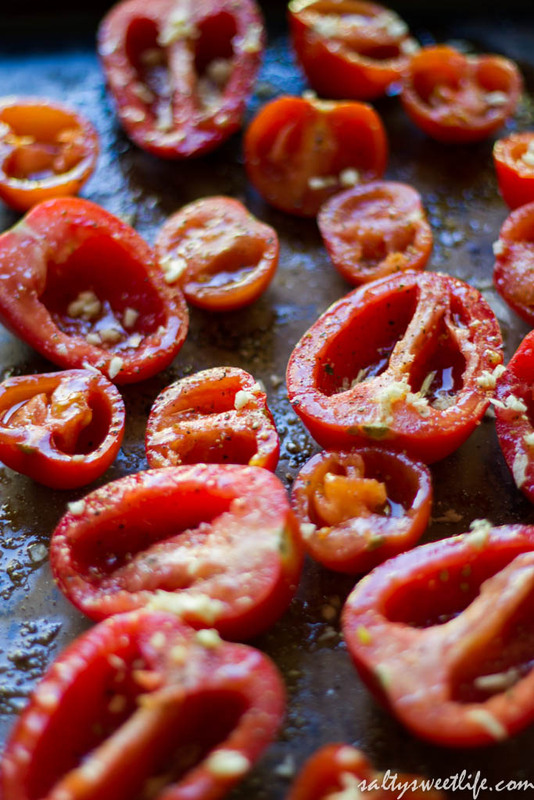 Place the tomatoes on a sheet pan and drizzle with the olive oil. Sprinkle them with garlic, the brown sugar, salt and pepper and place them in the oven. Roast for 1 1/2 to 2 hours or until the tomatoes are tender and caramelized. Bring a large pot of salted water to a boil. Drop the kale into the water and cook for about one minute, then drain the kale in a strainer. Immediately run cold water over the kale to stop the cooking process. After the kale has cooled, squeeze out the excess water with your hands and set it aside. Lightly toast the walnuts in a small dry frying pan over medium heat for 2-3 minutes, tossing often to keep it from burning. Remove from the heat. In the bowl of a food processor fitted with the metal blade, combine the garlic, walnuts, lemon zest, lemon juice and parmesan cheese. Pulse to combine. 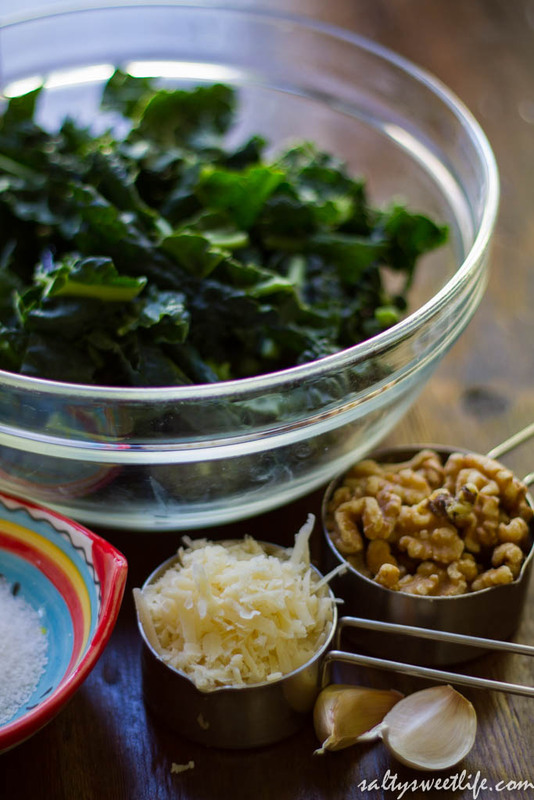 Add the kale, salt, pepper and water to the food processor bowl. Pulse to combine. Then, with the food processor running, slowly pour the olive oil into the feed tube and continue to process until the mixture is smooth. Taste and adjust the seasoning if needed. Drain the ciliegine and toss with 1/2 cup of the kale pesto. To assemble the salad, place a generous spoonful of the pesto on a salad plate. Top with two roasted tomatoes, then a few of the mozzarella balls followed by another two roasted tomatoes and more mozzarella. Garnish with freshly grated parmesan cheese and a drizzle of balsamic vinegar if desired. Serve at room temperature. I know that some of you are still in deep-freeze mode, but Spring is well on it’s way where I live! 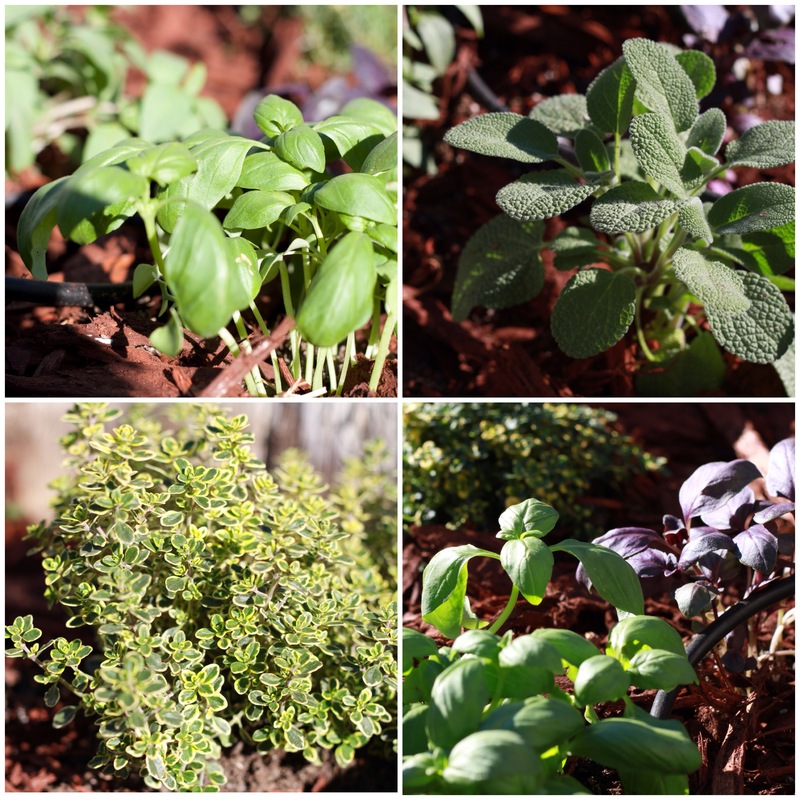 Over the weekend, I started my herb garden! In previous years, I’ve planted herbs in my backyard, but this year, I’m doing a little experiment and seeing if the front yard might have better sunlight. Hopefully, in a few weeks I’ll be able to make pesto from my new basil plants! Thank you Tina! Caprese is the best! Always reminds me of summer! I loved that kale pesto–it’s a bit earthier than basil pesto, and what a great way to get your dark, leafy greens! The tomatoes are calling out to me!!! They are asking me to reach my hands through the monitor and grab them!! Thank you for these Visual Treat. I am sure they are just as tasty as they look. Thank you Rimi! I’m so glad you liked it! Tomatoes for my tomato-loving friend!